VFW Buddy Poppies were available at the Hasbrouck Heights IHOP on May 12th with proceeds going to the Veterans of Foreign Wars Veterans Assistance Program. 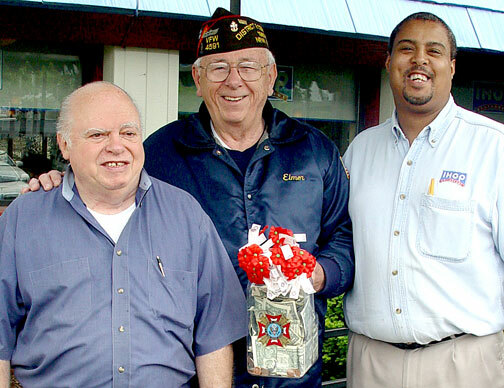 (l-r) IHOP owner Joe Costa, VFW Commander Elmer Winterfeld and IHOP Manager Norman Granger. Members of Post 4591 also offered Buddy Poppies at Shop-Rite, Pathmark and Stop & Shop. Every year in Hasbrouck Heights during Memorial Day Services at Memorial Park, there is a quiet moment as veterans come forward and place their "Buddy Poppy" at the base of the Memorial Stone. The Buddy Poppy is a small red flower symbolic of the blood shed in World War I by millions of Allied soldiers in defense of freedom. Inspired by Lt. Colonel John McCraes poem, "In Flanders Fields," which presented a striking image of the bright red flowers blooming among rows of white crosses marking the graves of the war dead in Belgium, two women started what is known today as the "Buddy Poppy" program. Georgia native, Moina Michael, known as "The Poppy Princess," started a smaller-scale Poppy Day in November 1918. After reading the poem she made a personal pledge to "keep the faith" and vowed always to wear a red poppy of Flanders Fields as a sign of remembrance. On November 9, 1918, she purchased 25 red poppies at a Wanamakers store; she wore one and distributed the rest, making this the first group effort of poppies being worn in memory of all who died in Flanders Fields. Ms. Michael began a tireless campaign to promote a symbolic reminder of those who had not returned home. In March 1919 she realized that there was also a need to remember those who were returning with mental, physical and spiritual needs. She widened the Poppy idea so that it could be used to help veterans. In September 1920, delegates at the Auxiliary to the American Legion Convention agreed that disabled American war veterans could make the poppies sold in the US, thus generating much needed income for veterans. Attending that convention was Madame E. Guerin, founder of the American and French Childrens League. She was concerned that the free world was "forgetting too soon those sleeping in Flanders Fields." In 1921, the Franco-American Childrens League began the first nationwide sale of poppies to benefit children in the devastated areas of France and Belgium. The poppy program received the cooperation of the VFW when it conducted its first poppy distribution before Memorial Day in 1922. The poppy was soon adopted as the official memorial flower of the Veterans of Foreign Wars. In 1923 a plan to pay disabled and needy American veterans to make the poppies was adopted, and the first VFW poppy factory was set up in Pittsburgh, Pennsylvania in 1924. It has since expanded to 11 locations. The name just "grew" out of the disabled poppy makers remembrances of their "buddies who never came back" from war. The little red flower became known as the "Buddy Poppy." In February 1924, the VFW registered the name "Buddy Poppy" with the U.S. Patent Office. For veterans in VA hospitals, domiciliaries and in state veterans homes, who assemble them -- every day is "Buddy Poppy" Day. VFW pays the disabled, needy or aging veteran for the work. Poppy assembly is often used as a therapy program to provide exercise for fingers and hands. All the money contributed by the public for Buddy Poppies is used in the cause of veterans welfare, or for the well being of their needy dependents and the orphans of veterans.